The regions of relatively constant sequence beyond the variable regions of immunoglobulins are termed constant regions (C regions) and are present in both the heavy and light chains. With very few exceptions, the sites of attachment for carbohydrates on immunoglobulins are located in these C regions. These regions also function to hold the variable regions together by using the disulfide bond between them. The C regions facilitate interaction with the antigen by increasing the maximum rotation of the immunoglobulin arms. Reportedly, a large population of patients with recurrent respiratory tract infection has low IgG4 concentrations. IgG4-related sclerosing disease has been recognized as a systemic disease entity characterized by an elevated serum IgG4 level, sclerosing fibrosis, and diffuse lymphoplasmacytic infiltration with the presence of many IgG4-positive plasma cells. 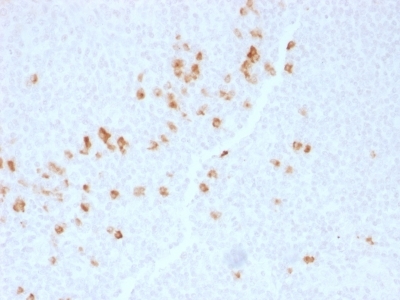 IgG4 is overexpressed in inflammatory pseudotumor (IPT) and under expressed in inflammatory myofibroblastic tumor (IMT). In pulmonary nodular lymphoid hyperplasia (PNLH), there are an increased number of IgG4+ plasma cells. enQuire Bio's IgG4 Anti-Human Monoclonal is available for Research Use Only. This antibody is guaranteed to work for a period of two years when properly stored.